“Butterfly” and “Sting,” get it? Forgot all about this guy and his was so classy. Then again, what kind of sniper targets a foot rather than head or chest? I’m not sure what you mean. I don’t think this guy was trying to shoot anyone’s foot, and the trap on the floor was probably set by the other pirates Frigg just killed. The four bolts that Syr/Nj is dodging are apparently all show at foot-level, and moreover, as we can see arc of their flight path over such a short distance and they land head-down, they were traveling at about casual-toss speed. Maybe as a result of whatever the pirate did in order to somehow fire four bolts (ineffectively slow) at once? More likely he’s above them on a ledge somewhere, or Syr’Nj seems to be diving away, so he’d be shooting downward in either case. Any kin to Bambi and Thumper? The assassins from the end of Diamonds Are Forever who cleaned Sean Connery’s clock and really should’ve been able to drown him? Sure, why not? Well, it was either them or Mr. Wink and Mr. Fib from ‘Kids next Door’ (although they were Bond parodies, now that I think about it). 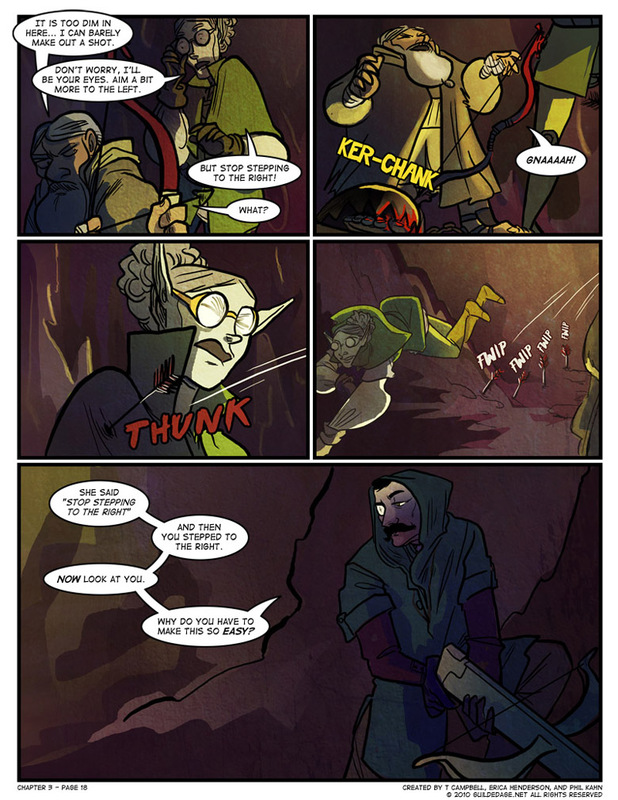 Gravedust’s trouble with low light always struck me as a nice subversion to the usual Dwarven tropes. He looks like the bomber guy from Disney’s Atlantis film. The dialogue can easily be heard in his voice too. Hey, look, I shot a dwarf and an elf. It only took me like, what? Ten seconds? Eleven, tops. Did Gravedust somehow put his foot in through the *bottom* of the trap? It looks like the teeth closed on his toes, but the toes are sticking *out* the maw of the trap.